On Good Friday, Cardinal Vincent marked the Lord’s Passion in central London by joining the Walk of Witness and attending the Wintershall Passion play in Trafalgar Square before leading the Solemn Commemoration of the Lord’s Passion in Westminster Cathedral. At 12 noon, Cardinal Vincent joined Christians of different denominations in the Walk of Witness which began at Methodist Central Hall. The procession, led by a man carrying a cross symbolising Christ’s journey to Calvary, made its away along Victoria Street to the amazement of many tourists and shoppers who stopped to take photos. On the steps of Westminster Cathedral, Cardinal Vincent explained that Christ’s suffering on the Cross includes all the suffering of the world throughout history to our present day, encompassing persecution, injustice, and every form of suffering. The Walk of Witness returned along Victoria Street to Westminster Abbey. Immediately following, the Cardinal attended the Passion Play in Trafalgar Square, performed by the Wintershall Players, where he led the crowd in the Lord’s Prayer. 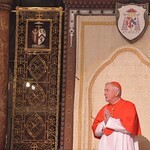 At 3pm, the Cardinal presided over the Solemn Commemoration of the Lord’s Passion in a packed Westminster Cathedral. Among the concelebrants were chaplains of the Cathedral and Bishop Mark Jabalé, Emeritus Bishop of Menevia. Additional photos from the Walk of Witness and the Solemn Commemoration of the Lord's Passion are available here.